Clips neatly on the end of your racket using the slide-and-click dock provided. Since it weighs less than a replacement grip you won't know it's there, yet the rugged construction and unique rubber ribs ensure that it can withstand all the rigours of play. The sensor automatically turns itself on when you start playing, and off when you stop. With a battery life of over 10 hours and storage for over 100,000 shots you don't have to worry about backup and recharging either. Analyses your racket's motion 1000 times a second, and sends the data seamlessly to the Racketware app via Bluetooth Low Energy. Attach the sensor to your racket - or take it off if you don't want to include this session in your data. Just get on court and play your match or do your practice or coaching session. We'll take care of the rest. Live stream your practice data to your mobile for instant shot by shot feedback. Or sync all your data post match, for a full breakdown of your stats. Discover your strengths and weaknesses, improve your stats, perfect your swing, and achieve your personal bests and personalised monthly goals. We tell you how you are hitting the ball during your swing: racket preparation, backswing, downswing, strike, and follow through. See what power and cut you are getting. Get instant live feedback on 12 aspects of your swing live during on-court practice. We keep all your personal bests so you can track your progress. Plus you get trophies awarded for reaching lifetime targets! You get all the stats on your match play: the perfect post-match analysis! Includes number of shots per rally, longest rally, number of rallies per match, and match pace. Highlights any stats that are out of the norm to help you see what's different. See what shots are winning rallies for you, and which are losing! There's a full breakdown of your winners and losers into drops and drives, forehand and backhand. Each month there are targets to aim for in order to keep your game improving. Is your fitness up to scratch, or do you tire during play? Check out your calorie use and effort level for every match. And see how your time on court breaks down: how much time do you spend actually playing! 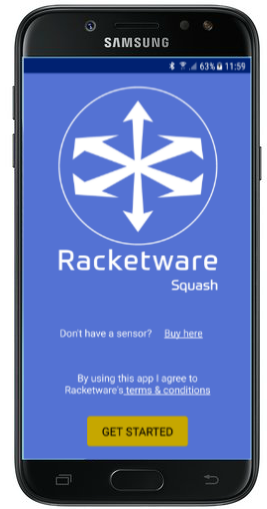 "We have been very impressed by Racketware's motion sensing technology and its application to squash. Providing detailed feedback on the player's use of the racket under real match conditions will be extremely useful for coaches and players alike, and a great incentive for players to both improve their game skills and also to play more squash. We are very keen to see the technology developed further and hope to find a role for it within the Elite Squad." At Racketware we're squash mad. So although we love the app and sensor we have today, we're putting a lot of effort into the next set of features. One thing we're super keen on is racket tracking. If you watch our video below you'll see that using your existing sensor - and some fancy software we have developed in the lab - we can track your racket around the court. We want to be able to tell every shot you hit, and see your movement patterns as you play. So keep an eye out for the next big thing! Don't miss out on Racketware! Sign up to our newsletter to be the first in the know.